By the time March rolls around, we all like to think there’s a light at the end of the tunnel and snow and ice will soon be just a memory as spring nears. But, we live in Maine. It’s just the reality of life in the Northeast: Snowstorms are a real possibility well into March and April. To ease the pain of a late season snowstorm, it helps to be ready to tackle the mess of one. Here are two crucial tips to help you prepare for the inevitable spring storm. Once we have a couple of warm March days, it might be tempting to put the salt and sand away in the back of the garage for next year. Remember though, doing so will just make dealing with a late season storm that much harder. When you already have to deal with snow and ice, why add to the frustration by having to fight your way to the back of the garage before work? Or when you’ve just gotten home from a day at the office? Keep your salt and sand easily accessible until the threat of snow and ice really has passed. The same goes for shovels – don’t pack them away or leave them out where they might get covered if there is an unexpected storm. Have them ready to grab and ready to go. If you have a snowblower, keep it gassed up and ready to start. The quicker you can get started on clearing snow, the quicker you’ll be done with clearing it away. During the depths of winter in Maine, snow and ice collect quickly on the roof. Both present dangerous and potentially expensive problems if not taken care of, and a late season storm can just exacerbate those problems. Raking your roof regularly throughout the winter can ensure that a late season storm doesn’t catch you by surprise and cause problems. One square foot of snow weighs about 20 pounds. That quickly adds up to create a dangerous situation with potential for roof damage — or even collapse — as well as an environment where ice dams can easily form. Ice dams are not only a danger to your property because of their weight (57 pounds for one square foot of ice!) but because they cause backups which cause water to seep through your roof and into your house. As we have warmer days followed by cooler days, melting snow and ice get trapped on your roof; the water freezes again, then melts again, and throughout this process it backs up and you might start seeing leaks in your roof. This isn’t just annoying — it’s expensive, especially when you consider the potential for mold growth on top of the water damage caused. Taking care of the snow and ice on your roof regularly throughout the winter can help you prevent many headaches when all you want to do is start enjoying the warmer weather. 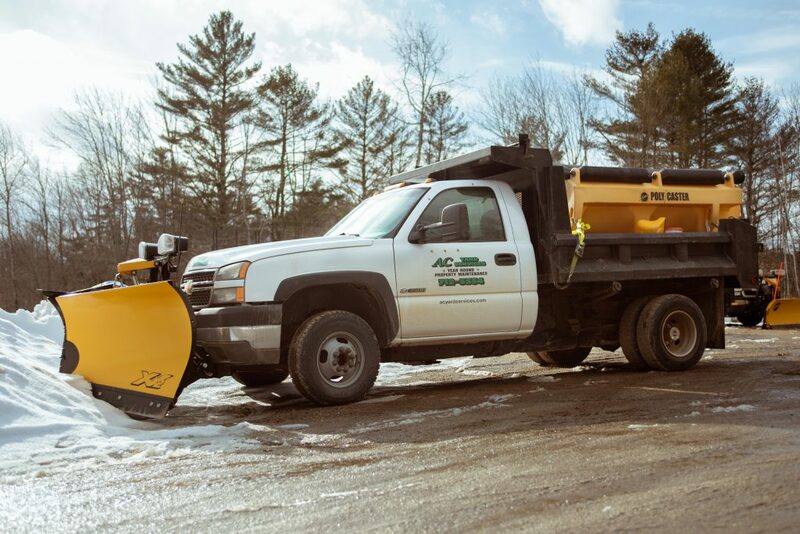 If you’d prefer to call in the professionals — as well as ensure you don’t have to worry about plowing and snow blowing — contact AC Yard Services to find out how we can help you take care of your property year round. The unpredictability of Maine weather can be both frustrating and exciting. There’s something rejuvenating about stepping outside on a random spring-like day that happens to pop up in the dead of winter. “We’re almost out of it,” you think … until the very next morning when temperatures drop right back down to the low 30s, settling in that range until about mid-April. However, that unpredictability can take a toll on the overall health and appearance of your property. That is, of course, if you are not giving it the time and attention a property needs. See, there is work to be done in every season that affects your yard for the upcoming one — and the topsy-turvy weather that comes along with it. Because of that, we have put together year-round plans that are designed to help your property thrive season after season. It’s convenient for you to know that we have you on our radar for everything from planting to raking to shoveling, allowing you to enjoy more of your free time while knowing that your property needs are being addressed. Let us explain how it all works. Let’s start at the beginning of the growing season — spring. As your property begins to emerge from underneath the snow and ice, you start looking forward to bright flowers, vegetable gardens, and a green lawn. In order to set your yard and garden up for a beautiful summer, spring yard work needs to be done. Our various year-round plans each offer different levels of services but all include spring work, like clean-up and mowing that preps your yard for ideal growth in the summer. It’s important to tackle spring cleanup, not just for aesthetic reasons but also to allow new growth to come in. Dead branches and old leaves can stunt growth of fresh grass and flowers. The AC Yard Services team will come in during the spring to clean up your yard and get it ready for summer growth. In the summer, your lawn and property are at their peak beauty. To help keep them that way year after year, proper mowing, pruning and other work should be done on a regular basis. Staying on top of such work keeps plants healthy and encourages good growth of your lawn. The healthier your lawn and your plants are overall, the better they will be able to handle Maine’s harsh winters. After all, the sun and warmth only return for a few months, so give your plants the chance to perk up and bloom! With a year-round plan from AC Yard Services, you don’t have to worry about making time for every chore that needs to be done to keep your yard and gardens healthy. Instead, you can leave that to us and know that your property is being well cared for. Raking. Snow removal. Not really crowd favorites. Nonetheless, they’re important both for the appearance of your property and for the health of your yard and gardens. A year-round plan with AC Yard Services will make sure the leaves are out of your yard before the first snow flies. We live in Maine, and snow comes early, but we’ll be ready to tackle the leaves in your yard. Keeping up with leaf removal can save your lawn from the impact that months of snow cover on top of leaves can have on your grass. 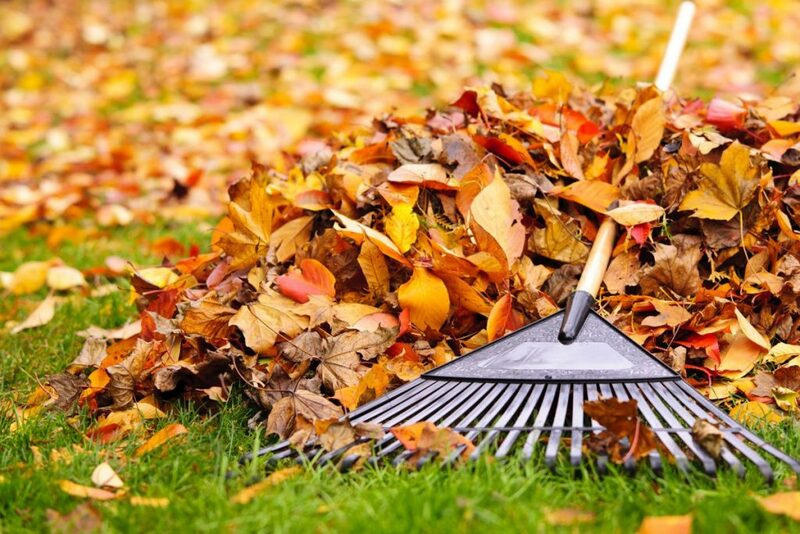 A general fall clean-up can make your yard much easier to deal with come spring, and much more attractive come late spring and summer. In the winter, a year-round plan with AC Yard Services means you can depend on us to come plow out your property. No more setting your alarm two hours early to get out the shovel so you can get your car out of the driveway. Our plow service is also done with care. We know your property from having worked on it throughout the year, and we’ll take precautions to ensure we’re not running over shrubbery or gardens or causing other damage. With four unpredictable seasons in Maine, the outdoors work never stops. But when you partner with AC Yard Services, we will make sure the work is done right and done on an effective to keep your property at its best all year. If you’d like to save yourself some time and keep your yard at its best, contact us today. Freezing cold days, winter weather advisories, school cancelations: It sure does feel like springtime is a long way away. While that may be the case, it is never too soon to think about what your yard will look like once it emerges from the springtime thaw. Owner Justin Hayden provides a few of his personal tips to get your property in tip-top shape for the spring and summer months. Check out the video below! If you are looking for a reliable year-round landscaping company to get your property warm-weather-ready, check out our year-round plans. 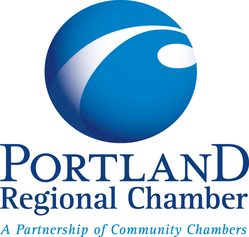 If you would like to learn more, please contact us today. Even for Maine it seems like the snow started early this year – and it keeps coming. For many people, early snow means they didn’t get to finish the fall chores they intended to. Leaves left on the ground are covered in snow, and now your brush pile can’t be taken care of until next year. 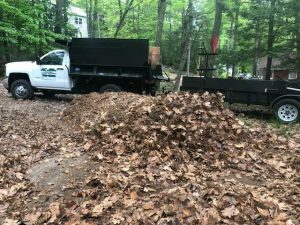 There are a lot of reasons people don’t finish up their fall chores until late fall – waiting until most of the leaves are on the ground, other commitments that take up time, or just putting it off because it’s not as fun to rake as it is to watch the Patriots. So once April comes, and there are still reminders of fall all across your property, no need to worry. With a year-round contract from AC Yard Services, our team will have your home or business springtime-ready. Once the snow (finally) melts and you start seeing leaves emerge you can rest easy knowing the AC Yard Services team will be there ready to get your lawn ready for spring and summer. A proper spring clean-up will both make your yard look better and keep it healthier. Spring chores like raking up the leftover leaves from fall and getting branches and other debris out of your yard let your lawn breathe easier and encourage it to grow better. Salt and sand covering your property? We’ll take care of it. We’ll also trim branches and shrubs to get your property looking neat and tidy in advance of summer. Winter in Maine can be long and tedious, and there’s no reason to keep reminders of it around longer than you need to. A year-round contract with AC Yard Services will give you more time to enjoy Maine’s beautiful but short summer and you’ll spend less time doing chores to get ready for it. To find out more about our year-round contract options, give us a call at (207) 712-5554 or send us an email at info@acyardservices.com. Hate raking? Do you put it off every year until it’s too late, or until you’re out there shivering in your flannel while you rake up soggy leaves? With a year-round contract from AC Yard Services, we’ll make sure your fall chores get taken care of. It’s important to get your yard cleared of leaves, brush and debris before the snow starts falling in order to protect your yard from damage. When you have leaves piled up on your lawn, then add pounds and pounds of snow on top of it, your lawn starts to suffocate. Sorry to tell you, but in Maine it’s pretty unlikely you’re going to avoid having snow pile up on top of leaves. Protect your lawn for the months that you can enjoy it, and let AC Yard Services take care of your fall chores. Having peace of mind about your plowing and shoveling needs before winter starts can be a game-changer. If you sign up for a year-round contract in the fall, you won’t have to panic about getting up early to shovel before work, or spend hours shoveling when you get home. You won’t have to dig your shovel out of the back of the garage, or struggle to make your way across dangerous ice on your property. The AC Yard Services team will take care of it for you. We offer plowing, sanding, snow blowing, and even roof raking to help keep your property clean and safe all winter long. There’s a lot to love about fall in Maine, and you should be able to enjoy it. When you’re spending hours raking your yard every weekend, you’re missing out on football games, fall foliage hikes, and apple picking with the family. Hire a team of professionals to take care of your fall chores, and you’ll be amazed at the amount of time that frees up for you to spend with your family in our beautiful state. So don’t miss another minute of the Patriots or another minute in the woods – give AC Yard Services a shout today and we’ll take care of your property year-round. For property owners, a beautiful lawn is a point of pride. It’s the first impression people have when approaching your home or business, making a beautiful lawn worth the work. While most people regularly mow, weed wack, fertilize, and edge their lawns, aeration is a lesser-utilized but no less important part of a healthy and lush lawn. Proper lawn care starts with fulfilling a lawn’s basic needs: water and air. 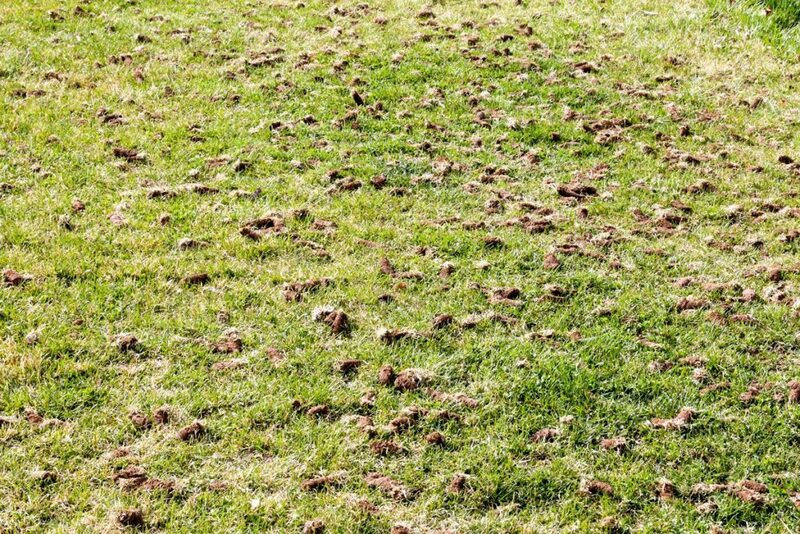 Aeration is the simple act of creating small holes through the lawn to allow water, air, and other nutrients to enrich the soil. You’re probably familiar with “Do not step on grass” signs in public places. These have a purpose – to prevent soil compaction. Compaction causes soil erosion and impairs your lawn’s ability to accept the flow of air and water. For those with large lawns this usually turns out to be unavoidable. Whether it be playing lawn games, lounging outside in the sun, kids playing, or simply walking across it, people compact the grass on a regular basis just through our regular activities. Aeration solves this by relieving the compaction and opening space that allows air to get to the roots and encourage water drainage. Regular aeration is required to make sure soil compaction and eventual thatching do not destroy the lawn. Once lawn compaction is relieved, your lawn can breathe again. These punctures create a path for air, water, and fertilizers to enrich the soil. It is a best practice to fertilize immediately after aeration because it ensures those essential nutrients penetrate through the lawn and into the soil. Without professional aeration, the lawn will fail to receive the maximum benefit from those vital nutrients. Aeration is essential for ensuring the healthy strength of grass roots and the reduction of pooling. Though we don’t think about it often, grass is a series of plants living side by side across a wide space. It can get congested and create mismatched growth. Routine aeration allows grass roots to grow properly within their own space in the soil. The reduction of pooling and runoff is one of the most critical effects of aeration. Heavy thatch prevents water from properly reaching the soil beneath where it is absorbed. So what happens to the excess water from rainfall? It creates a pool on the surface of the lawn, killing the grass and the roots underneath. Or, the water creates runoffs from hills and valuable nutrients in rainwater are moved away from the soil. A properly aerated lawn provides paths for that water to flow into the soil, providing nutrients and preventing lawn damage. How can I properly aerate my yard? The proper equipment and time to aerate a yard differs greatly depending on how big your yard is and what kind of soil is beneath the surface. If you think it’s time to check if your lawn is properly aerated give us a call at 1-(207) 712-5554 or email us at info@acyardservices.com. We would love to show you what we can do to make sure your lawn is lush and healthy. Whether you’re putting in a new perennial flower bed, filling in your existing landscaping beds with annuals or simply need to replace a few plants, the right mix of fresh flowers and plants can help take the appearance of your property to the next level. We asked owner, Justin Hayden, to share three of his favorite plantings, Check out what he has to say below. If you are looking for some more inspiration, check out our blog post on more of our favorite plantings. Why should customers trust AC Yard Services with a year-round plan? We understand that for some people, trusting others with the health and appearance of their property can be a touchy subject. As property owners know, there are plenty of long-term benefits to year-round maintenance. From improved curb appeal to an overall healthier yard, year-round care is key to keeping your property looking its best. Luckily for our customers, AC Yard Services knows how to optimize seasonal work for the best results. Whether you’re looking for a simple seasonal cleanup or the full-suite of property maintenance services, we have a year-round plan that’s right for you. 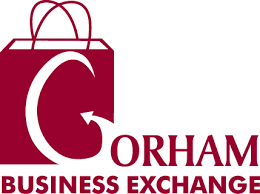 We currently offer three different plans, but also give our customers the option to customize a package that fits their needs. Shoveling in the winter. Raking in the fall. Mowing and weeding in the spring, summer, and fall. Yardwork in Maine can be so inconvenient, no matter how small or large your property. Year-round plans: What is the biggest value? 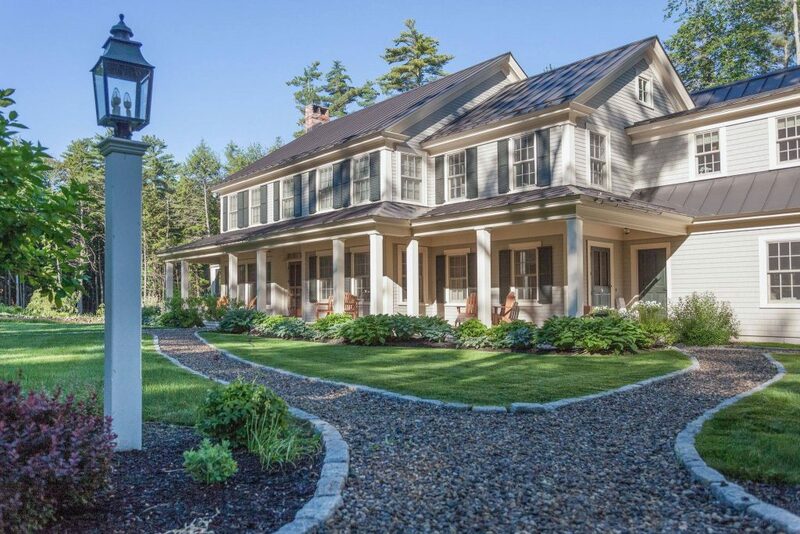 We’ve said it before, and we’ll say it again: Yardwork in Maine never seems to end. It always seems like there’s mowing to be done, or mulch to be put down, or dare we say in these summer months, snow to be plowed. But when the weather is nice, chances are you want to spend more of your time enjoying your property than working on it. That’s why our year-round plans are such a great value: time. We come over and take care of your yard, while you get back your valuable free time. It’s that simple.